Paints markers in a transparent version of their selected colour. The degree of transparency is determined by how many points are plotted on top of each other and by the opaque limit. The opaque limit fixes how many points must be plotted on top of each other to completely obscure the background. This is set to a fixed value, so a transparent level that works well for a crowded region (or low magnification) may not work so well for a sparse region (or when zoomed in). 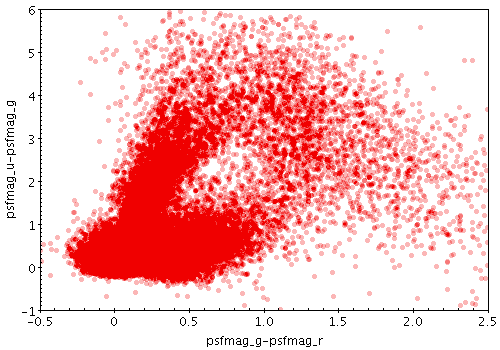 The opacity of plotted points. The value is the number of points which have to be overplotted before the background is fully obscured.